Some may like gin on its own while others without being particularly interested in it would be admirers of the classic gin based cocktails including the Martini, Gin and Tonic or the Negroni, but no matter which gin cocktail you prefer, its fascinating history will give you something to ponder about, the next time you sip a drink. 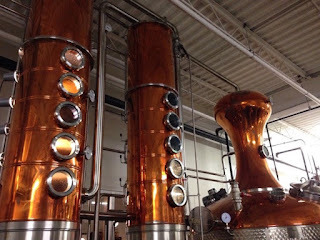 The history of gin has seen many twists and turns along the way, from fighting diseases, to providing cures for soldiers in foreign lands, to being a public health menace and along the way being refined, with innovative distillation techniques and creative use of botanicals. Though gin is commonly viewed as a British product, its early history can be traced to Italy, the Flanders and the Netherlands where it was used as a medicinal drink. The first traces of wine distillates with infused herbs date back to the 12th century in Italy where references can be found in the Compendium Salernitanum of the Schola Medica Salernitana. Situated in the south Italian city of Salerno, The Schola Medica Salernitana, founded in the 9th century, was influenced by the Arabic and Greek medical practices and treatises, an approach based on the practice and culture of prevention rather than cure. 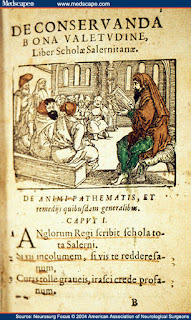 The school which was an important source of medical knowledge in Western Europe between the 10th and 13th centuries had its foundation in the Greek past of southern Italy and was supplemented from Arabic medical practices, particularly from neighboring Sicily, which was then ruled by the Moors. 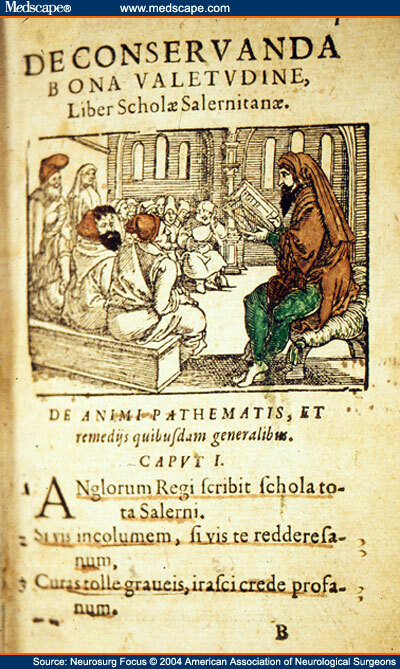 The beginning of Salerno's classic period happened in 1077 after the arrival of Constantine Africanus, a physician who spent part of his life in North Africa, and was knowledgeable on the medical practices of ancient India and writings from Arabic sources which he helped translate. The distillation of wine and the properties of alcohol were known to Islamic chemists from the eighth century. Jabir ibn Hayyan (c. 721-815 CE) an alchemist is considered an important figure in the experimentation on distillation. Later, Al-Kindi (c. 801-873 CE) described the distillation of wine in his Kitab al-Taraffuq fi al-‘itr (The Book of the Chemistry of Perfume and Distillations). 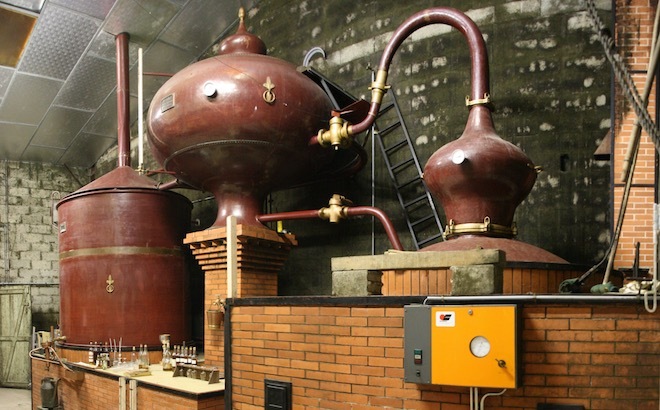 The school in Salerno, used this distilling knowledge to create alcohol and infuse it with various botanicals, for their medical experimentation. Starting from around the 12th century, monks and alchemists across Europe, particularly in Italy, Germany, Southern France, Flanders and Netherlands joined the quest to produce 'aqua vita', or 'water of life' from distilled grapes and grains. The earliest use of botanicals in fermented alcoholic beverages dates back many centuries in the ancient lands of China and India where the medicinal use of herbs and spices are well know. The ancient Greeks are also known to have infused wine with resins, spices and herbs to improve its taste. Vermouth has some similarities with gin, and you might find its history fascinating too. The first recorded mention of genever (jenever in Dutch) as a distilled beverage flavored with juniper was in the 16th century, in a book called Een Constelijck Distileerboec by Antwerp-based Philippus Hermanni. By the mid 17th century, numerous small Dutch and Flemish distillers had popularized the re-distillation of malt spirit or malt wine with juniper, anise, caraway, coriander etc. to improve its taste and also treat medical problems such as kidney ailments, stomach ailments, gallstones and gout. A 17th century distilling ban led to Flemish distillers migrating their genever distilleries throughout the Netherlands, France, and Germany, where the liquor further evolved. Flanders, was then a part of Southern Netherlands. Today, Flanders is the Dutch-speaking northern portion of Belgium. In 2008, the European Union declared genever a 'Protected Product of Origin', receiving its own appellation or AOC. Genever can only be crafted in Belgium, the Netherlands, along with specific regions in France and Germany. Gin emerged in England in varying forms as of the early 17th century, and it is claimed that English soldiers who provided support in Antwerp against the Spanish in 1585, were already drinking genever for its calming effects before battle. In England, the word 'gin', was used to refer to the English version of the juniper-flavored grain-based alcohol, a shortened form of the older English word genever, related to the French word genièvre and the Dutch word jenever. After William III also widely known as William of Orange, ruler of the Dutch Republic, occupied the British throne with his wife Mary in 1689, gin became more popular, as taxes on locally distilled spirit were dropped and a heavy duty was imposed on all imported spirits such as French brandy, driven by a political conflict between Britain and France. This created a larger market for poor quality barley that was unfit for brewing beer, and in the first half of the 18th century, thousands of gin-shops sprang up throughout England, a period known as the Gin Craze. 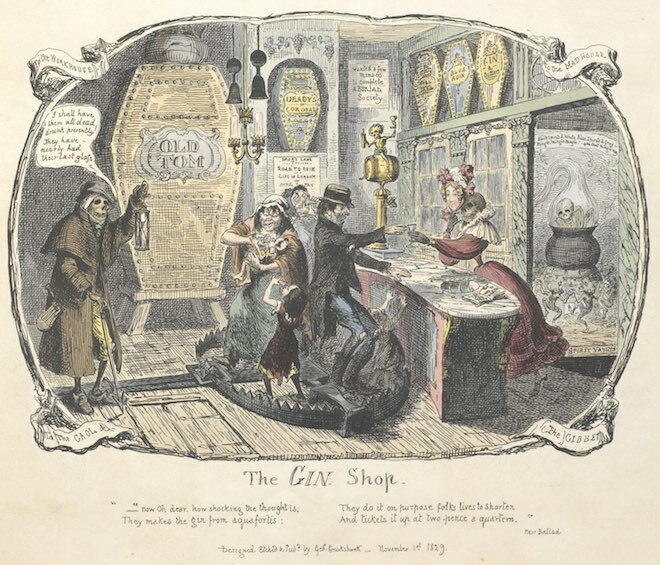 Because of the low price of gin, when compared with other drinks available at the same time, gin began to be consumed regularly by the poor, and as many people over-consumed, it caused the greatest public concern. 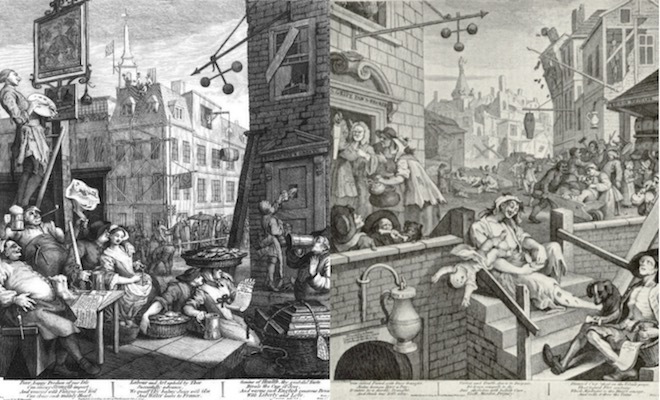 The gin crisis in England in the 18th century are dramatically portrayed in two prints issued in 1751 by English artist William Hogarth, known as Beer Street and Gin Lane, in support of what would become the Gin Act of 1751. Designed to be viewed alongside each other, they depict the evils of the consumption of gin as a contrast to the merits of drinking beer. 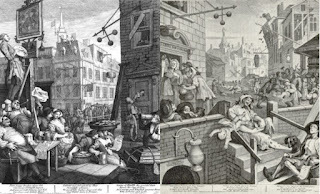 Hogarth portrays the inhabitants of Beer Street as happy and healthy, nourished by the native English ale, and those who live in Gin Lane as destroyed by their addiction to gin, perceived as a foreign spirit. The Gin Act of 1751, prohibited gin distillers from selling to unlicensed merchants and forced them to sell only to licensed retailers, thereby eliminating small gin shops and restricting the distribution of gin to larger distillers and retailers. Gin in the 18th century was produced in pot stills, and was somewhat sweeter than the London gin known today. Old Tom gin, a recipe popular in 18th-century England, can be described as a sweeter style of gin, often containing sugar. The invention and development of the column still around the 1830s made it easier for distillers to create clean, high proof spirits, thus enabling the creation of the 'London dry' style that evolved later in the 19th century. 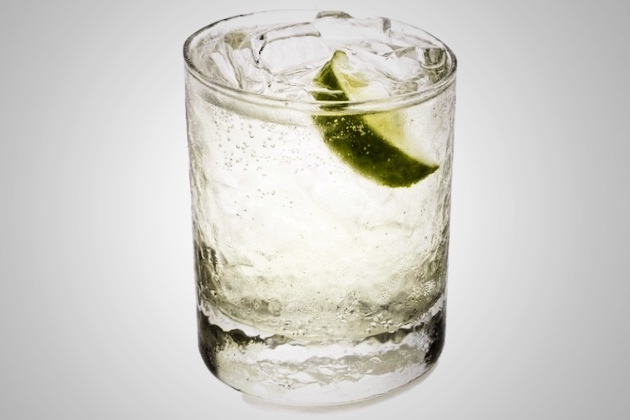 The word 'dry' emerged to describe an unsweetened gin. 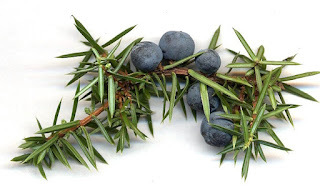 Although genever is an ancestor of gin and both of them are based on juniper as a main ingredient, there are some fundamental differences, both in the process of production and flavor between these two liquors. Gin is created by mixing a neutral spirit base with a blend of botanicals, predominantly juniper. Genever has a completely different base, a distillate made from a combination of rye, malted barley, wheat and corn referred to as malt wine, which tends to give it a whiskey-like base. 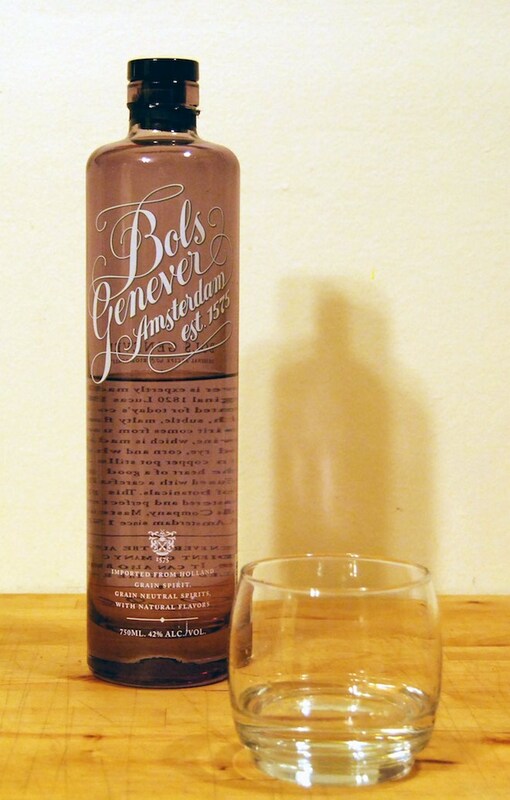 The malt wine is then blended with a neutral spirit and a botanical mix to create genever. 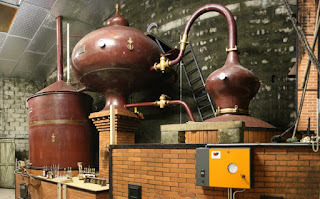 There are two types of jenever: oude (old) and jonge (young) based on the distilling techniques. Jonge jenever contains more grain instead of malt and has a neutral taste, with a slight aroma of juniper and malt wine while oude jenever has a smoother, very aromatic taste with malty flavours. Gin became popular with the bartenders in the late 19th century. Jerry Thomas' 1887 edition of 'Bartender's Guide, How to Mix All Kinds of Plain and Fancy Drinks' features a few gin based cocktails using Holland gin and Old Tom gin. The guide also has a recipe for the Martinez Cocktail, made from Old Tom gin. 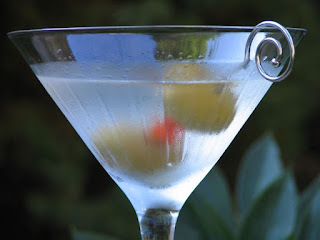 The Martini which evolved from the earlier recipes of gin cocktails reached its most recognizable form by the early 1920s in which London dry gin and dry vermouth were used. During Prohibition, the relative ease of illegal gin production led to the martini's rise as the predominant cocktail of the mid-20th century in the United States. Other classic gin based cocktails from the 19th century include the Gin Fiz and the Tom Collins. Gin and Tonic cocktail was introduced by the army of the British East India Company in India and and other tropical regions, where malaria was a persistent problem, and quinine was known to prevent the disease. British officers in India in the early 19th century took to adding a mixture of water, sugar, lime and gin to the quinine in order to make the drink more palatable, thus Gin and Tonic was born. The Negroni which uses gin and sweet vermouth and the Singapore Sling, a gin-based cocktail from Singapore, were invented in the early 20th century. If you love cocktails, you might want to know more about the Five classic Southern cocktails.